Prescription opioid use among injured workers decreased in many states, but not all, according to the Workers Compensation Research Institute (WCRI). Find out which states saw the largest decreases in this new WCRI study. The National Safety Council (NSC) has developed a new industry specific online calculator that informs employers how much the opioid epidemic is costing companies each year. The tool provides business leaders with specific information about the cost of substance use (including prescription drug abuse and misuse, alcohol abuse and misuse, opioid and heroin addiction as well as abuse of other illicit drugs and marijuana) in their workplace based on size of employee base, industry and state. Posted here, the NSC calculator combines latest government and private sector research to estimate annual costs in three categories: time lost form work, job turnover and retraining, and health care costs. A new NSC survey found only 39% of employers view prescription drug use as a threat to safety, and only 24% feel it is a problem, despite 71% saying they have experienced an issue. What are hurricane deductibles and how do they work? Homeowners in New Jersey, North Carolina, South Carolina, Florida and Texas were asked this question in an online survey conducted on behalf of the Insurance Research Council (IRC). Not only did one-third of respondents say they had never heard of these deductibles or were not sure what they were, one quarter of them lacked an understanding of deductibles in general, the IRC poll found. More on hurricane and named storm deductibles from the National Association of Insurance Commissioners (NAIC) website. How do ransomware attacks impact cyber insurance loss ratios? Another global ransomware attack, dubbed Petya, has disrupted operations at major firms across Europe and the United States. More than 100 companies and organizations across various industries were affected, including shipping and transport firm AP Moller-Maersk, advertising firm WPP, law firm DLA Piper, Russian steel and oil firms Evraz and Rosneft, French construction materials company Saint-Gobain, food company Mondelez, drug giant Merck & Co, and Pennsylvania healthcare systems provider Heritage Valley Health System. Today’s Insurance Information Institute Daily, via The Wall Street Journal, reports that the attack has exposed previously unknown weaknesses in computer systems widely used in the West. The U.S. cyber insurance market grew by 35 percent from 2015 to 2016, based on recent reports. 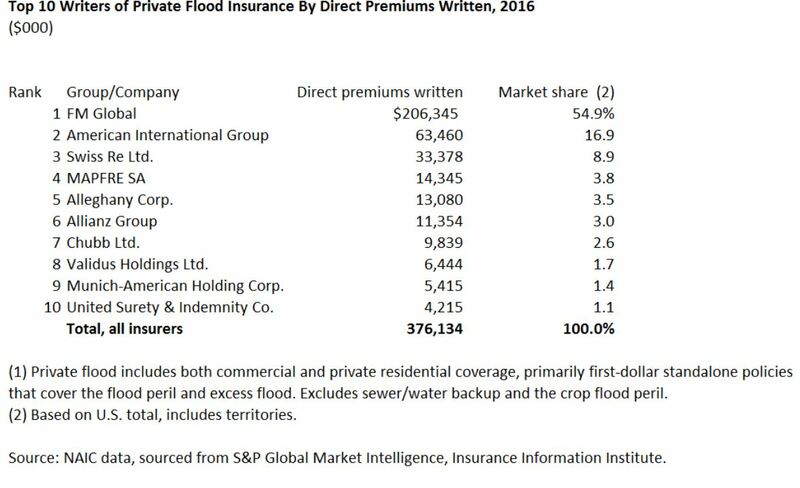 From A.M. Best: U.S. property/casualty insurers wrote $1.35 billion in direct written premium for cyber insurance in 2016. Overall, cyber insurance for the majority of companies was profitable and the direct loss ratio decreased by 4.5 percentage points to 46.9 percent in 2016, from 51.4 percent in 2015. Read our earlier post on insurance for ransomware attacks. Insurers have to worry about everything, it seems. For example, the standard commercial general liability policy covers advertising injury. So what constitutes an advertisement? The National Transportation Safety Board (NTSB) released 500 pages of documents on last year’s fatal Tesla Autopilot accident in Florida. Per the initial press release the report contains only factual information on the investigation including highway design, vehicle performance, human performance, and motor carrier factors. Since lateral control (swerving) couldn’t have avoided this crash (the truck is almost 70 ft long (6 lanes wide) stretching broadside across the highway) , it doesn’t matter if Josh Brown ever had his hands on the steering wheel. That’s totally irrelevant. Why didn’t autobrake kick in when the tractor part of the tractor-trailer passed in front of the Tesla? How fast was the truck going when it cut off the Tesla? I couldn’t find the answer in 500 pages. The full 500 page report is also available to view at NTSB: Docket Management System. Airbags help save thousands of lives every year, but in the case of Takata Corp, the company’s exploding inflators have been linked to at least 16 deaths worldwide and more than 180 injuries. Takata’s filing for bankruptcy protection in the U.S. and Japan and $1.6 billion sale of its assets to Key Safety Systems is the latest twist in what has been described as the largest and most complex automotive recall in history. This is a reminder of how important it is to check your vehicle for airbag­–and indeed any other recalls–at the NHTSA website. The NHTSA Vehicle Identification Number (VIN) search tool allows you to access recall information provided by the manufacturer conducting the recall which may not yet be posted on the website. Finding out fast about safety problems with your vehicles, tires or car seat allows you to get your car repaired (manufacturers are responsible for costs) and to protect you and your passengers. The National Safety Council and Fiat Chrysler just launched an awareness campaign “Check to Protect” to encourage vehicle owners to make recall checks. Check out Insurance Information Institute facts and statistics on product recall insurance. If you’re among the millions of people attending a Pride parade in your home city this weekend, look out for participating insurers. Many companies support LGBT (lesbian, gay, bisexual and transgender) events throughout the month of June and indeed year-round as part of their continuing commitment to diversity and inclusion. Some 36 insurers were recently recognized as one of the “best places to work for LGBT equality” by the Human Rights Campaign (HRC) Foundation, earning a perfect score of 100 percent on their 2017 Corporate Equality Index. Here’s an overview of diversity and inclusion in the insurance industry from the Insurance Information Institute. Heavy rainfall due to Tropical Storm Cindy is expected to produce flash flooding across parts of southern Louisiana, Mississippi, Alabama, and the Florida Panhandle, according to the National Hurricane Center (NHC). Total rain accumulations of 6 to 9 inches with isolated maximum amounts of 12 inches are expected in those areas, the NHC says. On Tuesday, Alabama Governor Kay Ivey declared a statewide state of emergency in preparation for severe weather and warned residents to be prepared for potential flood conditions. FEMA flood safety and preparation tips are here. Flood damage is excluded under standard homeowners and renters insurance policies. However, flood coverage is available in the form of a separate policy both from the National Flood Insurance Program (NFIP) and from a few private insurers. 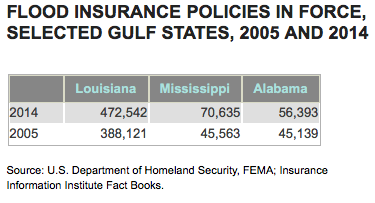 Insurance Information Institute flood insurance facts and statistics show that the number of flood insurance policies increased in Alabama, Louisiana and Mississippi after 2005’s Hurricane Katrina.